Just wanted to say I really like this app. 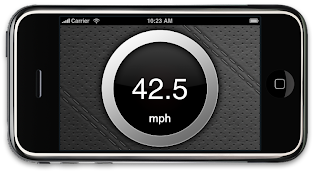 There are several speedometer apps on the appstore that also run and tests the "speed" using the accelerometer. Do you think you can add an update where we can switch to "reading the speed" based on the accelerometer? (ie. Running/jogging with speed open, the accelerometer will read the mph or etc we are going at). Hi I have version 1.0.9 now and the display, dimms sometimes?? So I have to tap it again, that the brightness go back on.